Happy Easter all if you celebrate. And happy Passover to those who celebrated the Jewish holiday. Today is April Fools’ Day as well as Easter. Interesting that it falls on the same day. As we returned from the warmth and sun of Florida, Minnesota had inches of snow and it’s bitterly cold. Fooled us. Nonsense. You are not under attack. If you are law abiding gun owners, what do you have to fear but fear itself? Yes, we know you love your guns and you have your rights. No one is saying otherwise. But why flaunt your AR-15s after the Parkland shooting? Where is your common sense? The public doesn’t like to see your openly carried guns. Not on the week-end of Easter. Not on the week-end of Passover. Why do you think this is going to help your cause? You have nothing to fear with the suggested stronger gun laws now sitting in Congress and state houses all over the country. What are you so afraid of? “It is really about common sense gun safety legislation like universal background checks, which are supported by the overwhelming majority of Americans,” Farnsworth said. But Minnesota Gun Rights says it wants to make sure the voices of firearms owners are heard, and that the Republican-led Legislature knows it will face political repercussions if lawmakers advance any new gun control measures. Gun owners’ voices have been the only voices heard at the legislature. That is about to change. It appears that you might be afraid of the students. And the fear has caused some really stupid and offensive things to happen. For one thing, harassing and attacking students is just not working. They are not having it and neither are we. We see through this fear of yours. You are afraid that a group of students is actually changing the conversation around your gun rights. All they are doing is trying to stop school shootings so they don’t have to be afraid to go to school every day to do what they are supposed to do as students. What about you? Are you so afraid to go to work, go to church, go to a park or a shopping mall that you need a gun to protect yourself? Go ahead if that’s what you want. But the chances of using that gun to protect yourself in those situations are slim to none. “All you have to do now is not only feel sorry for the liars, but you have to go against them and pray to God that the lies can be crushed and the liars can be silenced so that real measures can be put into place to actually save children’s lives,” Nugent said. Many conservatives have been critical of the Parkland survivors’ political beliefs, which isn’t too surprising given that they generally want gun control. But some, like Nugent, have gone further than that — attacking the kids for unrelated and often personal aspects of their lives. No soul? Who is the fool who said that? And why would you say that about innocent students who have just gone through the trauma of a mass shooting at their school, in some cases, watching their classmates be slaughtered in cold blood? What we should all be afraid of is your unrelenting lies and misperceptions that have caused our leaders to be afraid of you. Well, you have fooled them. You are only about 1.5% of gun owners and Americans. Why should we all be afraid of you? We should be afraid of the 97% of Americans who want universal background checks but are not getting them. We should be afraid of the domestic shootings and suicides that cause so much devastation in our country. We should be afraid of little kids finding their parents unlocked, loaded guns and killing themselves or someone else. We should be afraid of those loaded guns ostensibly for self defense “accidentally” discharging, sometimes harming another human being. We should be afraid of the fear of others instilled in police officers and others that cause people to shoot first and ask questions later. But it’s not a local issue — it’s a national issue. And like every American who claims to be a gun violence prevention advocate, I have a responsibility to speak out against this uniquely American crisis. The unlawful shootings of Black and Brown people by law enforcement is gun violence. If we want to end gun violence, then we have to fight the systemic racism that can cause it, too. Our country’s culture of shooting at what scares us has a body count in Black and Brown lives. Research has shown that Black people are three times more likely to be shot and killed by police than white men. In addition, Black men are 13 times more likely than white men to be victims of gun homicides. Black children and teens are 14 times more likely to be the victims of gun homicides than white children and teens. This is something to fear and something that cannot be hidden under the rug. The student movement after the Parkland shooting has raised the issue of shootings of young people of color as well as mass shootings and school shootings. So who are the fools out there? Let’s be clear about this. No one needs to be fooled by the ramped up fear and paranoia of the gun rights extremists. I was so proud to have marched with the students in Duluth last Saturday. About 1000 turned out on a cold day to listen to students tell their stories and hear from a graduate student who was the mother of a shooting victim last December tell her story. This is the American tragedy. We have been fooled by the NRA lapdogs. No more. The students are challenging everything and because of it right wing FOX TV host Laura Ingraham is in trouble. Why did she foolishly go after the students? She didn’t have to do that. But she is afraid of their power. She is afraid they may be right and that our leaders will and are listening to them instead of her hate. Why did Vermont gun owners have a rally like that in Minnesota and give away high capacity magazines at the rally to show their opposition to laws that are about to be signed by their Governor in a gun friendly state? How foolish of them. The public understands what AR-15s and high capacity magazines do to our students and others. We understand. We will not be fooled. Somehow it became acceptable over the past several days and weeks for politicians and others to mock mourning students-turned-activists who survived the mass shooting at Marjory Stoneman Douglas High School in Florida. At what age is it OK to bully someone whose classmates were murdered at school? 14? 16? Adults on social media claim that because our young people aren’t as familiar with lawmaking or the Second Amendment or might not have known the difference between an automatic and a semiautomatic rifle two years ago, they can’t possibly know what they need to feel safe at school. But those who organized and attended last weekend’s March For Our Lives are not to be trifled with. They have the power of social media and the power of their votes. It’s a bit short-sighted to think that because young people have historically not turned out to vote in large numbers that they won’t come out in droves come November. Don’t be fooled by the corporate gun lobby. And remember the victims and their families on this Easter holiday that will not be happy for far too many. Their empty shoes are filled with memories and their families grieve on this day and all days. Let’s make the Parkland shooting the last school shooting said one of the Marjory Stoneman Douglas high school students interviewed after 17 of his school classmates were slaughtered. The last school shooting took the lives of 17 Parkland, Florida students and educators and traumatized the entire nation. The injured will recover, some with life long debilitating injuries, others left with only the trauma. We are all traumatized. The thing is, Columbine should have been the last school shooting. Virginia Tech should have been the last school shooting. Sandy Hook for sure should have been the last school shooting. Our kids are sitting ducks. But ducks are better protected from bullets than kids given that duck hunters must use a plug to prevent a hunter from using more than 3 shots at a time. It’s to sustain the duck population for future hunters. Who is sustaining the population of our children? Something is different this time. Teachers, students, parents, law enforcement and the media- all speaking out in stronger and more urgent voices asking the “adults” in Congress to act on behalf of our children. Insanity is the word that comes to mind. We are all exhausted but we are not numb and we are not stupid. We understand what is going on here. We get that our loose gun laws are killing our precious human resources and snuffing out the potential of dozens of kids to live a productive life with their friends and family. Last night 300 people came out for a vigil outside of NRA headquarters in Fairfax, Virginia. Some of my friends were there. 1000 people came out in Parkland to honor the victims. But without action, none of this matters. Speaking of the NRA, I can’t even begin to add up the media articles and stories about how much that organization has contributed to the mayhem and carnage. The time has come to turn on the corporate gun lobby, whose profit motive has become the main reason for existence. It is not your father’s or your grandfather’s NRA any more. Listen to the voices of gun owners and former NRA members. Don’t tell me teachers should be carrying weapons in the classroom — we’re not police. It’s our job to assign books, create lessons and lead discussions that make students think critically and help them see the world a little differently: I want them to read “The Outsiders” in my class and remember it when they’re adults and their kids are reading it. Don’t tell me there’s nothing we can do about guns. Yes, Americans have a constitutional right to bear arms — but it’s not limitless. And we all have the right to live. “Please, this is the 18th one this year. That’s unacceptable. We’re children. You guys are the adults,” David Hogg said during an interview on CNN. And well they should. Read this frightening article about real and not so real threats made by students after the Parkland shooting. My God. What is going on? Where are the adults in the room? Remember that every gun in the hands of a child must first pass through the hands of an adult. Talk about the influence of even the Russians in our gun violence epidemic in America. The NRA has a connection with the Russians. The NRA has connections with our President. The Brady Center went to court to get a white paper written with the help of the NRA presented to the President right before his inauguration. Talk about Brady background checks. Talk about Extreme Risk Protection Orders. Equally important for a gunman looking to do a lot of damage in a hurry: AR-15-style weapons are fed with box magazines that can be swapped out quickly. The standard magazine holds 30 rounds. Equipped in this way, a gunman can fire more than a hundred rounds in minutes. The Parkland shooter had “countless magazines” for his AR-15, the local sheriff said. And there is still one more reason the weapons are so popular in states like Florida: They are easy to buy — and for Nikolas Cruz, 19, the shooting suspect, far easier to obtain than a handgun. On a scale of effectiveness ranging from 1 (not effective) to 10 (highly effective), the expert panel gave an average score of 6.8 to both an assault weapons ban and a ban on high-capacity magazines, the highest ratings among the nearly 30 policies surveyed. (…) More strikingly, substantial numbers of gun owners supported the measures as well: 48 percent of gun owners in that poll said they would support a ban on assault style weapons, and 44 percent said they favored a ban on high-capacity magazines. A Quinnipiac poll conducted later in the year showed similar numbers. Talk about research on the causes and effects of gun violence. Talk about how much money our leaders are getting from the NRA. Ask all candidates what their plans are for preventing shootings and saving lives. Ideally we would also rethink the Second Amendment in an age where firearms are far more lethal than in the 18th century and where we no longer require minutemen to protect our liberties from the redcoats. But it’s not necessary to repeal the Second Amendment. The courts have consistently upheld gun regulations in the past, including a federal assault-weapon ban that was in effect from 1994 to 2004 and a Maryland ban that went into effect in 2013. Yet instead of instituting such common-sense safeguards, Congress is moving in the opposite direction. Early in 2017, Congress passed and President Trump signed a bill that revoked an Obama-era regulation that would have made it harder for mentally ill people to buy guns. Toward the end of the year, the House passed legislation that would force every state to honor concealed-carry permits — meaning that a resident of Oklahoma could pack heat in the District of Columbia or New York City. And talk about all of these things with common sense conversations and actions. Talk about the insanity of American gun laws and shootings as the rest of the world is watching this insanity unfold. This article highlights an Australian perspective into our shootings. Do we love our children as much as we love our guns? That is a very important question that needs an answer. Make this the last school shooting. Because the last one has started a movement and a conversation that is not going away. The accumulation of bodies and inaction by Congress and state legislatures if finally just too much for a nation that sees more gun violence than any other democratized country not at war. Our kids are the victims of knock-off military style weapons used in war. As one friend said, our children have become war correspondents, live streaming a shooter killing their friends and texting parents as the shooting occurs. With the help of adults, students are going to take national action as the Women’s March has organized a national student walk-out set for March 14th. We shouldn’t have to do this. This is an American tragedy. Listen up Mr. President. Spend more than 6 minutes “listening” to the victims of the shooting at the Parkland hospital. Your tone deaf anemic, robotic statement a day after the shooting did not even mention the word guns or gun violence. Your lack of passion and empathy was disheartening and disturbing. Have a nice week-end on the golf course at Mar-a-Lago. It’s been 5 years since one of our nation’s heinous mass shootings. Only one of them. We have so many that we can say this in America. And these kinds of mass shootings continue today in spite of the efforts of many and the outright support of the majority of Americans to do something about them. Aurora, Colorado where innocent people went to the movie theater to see the opening night of The Dark Night Rises. They were excited. They were happy to be at this event with friends and family. They likely bought popcorn, candy and softdrinks and texted friends and family that they had gotten in for the premier showing of a very popular movie. And then, without notice or warning, a young mentally ill man stepped into the theater through an exit door and started shooting. No reason. He just decided to shoot at everyone and anyone in his sight or even not in his sight. People screamed. Some ran out and got away from the shooter. Chaos reigned. It was dark. It was noisy with gunshots. It was so frightening that is was unimaginable to us and we can’t put ourselves there without getting shivers. No one could have saved the victims or killed the shooter because they were so busy trying to run, hide, save themselves or throw their bodies on someone else to save a life. That is what happens in mass shootings. They are totally unexpected. But the corporate gun lobby would have us believe the impossible- if only someone had a gun..….. If only. Anyone remember another high profile shooting in a theater involving a “law abiding” gun owner and concealed weapons permit holder shot an innocent man over texting and popcorn? Mr. Holmes purchased all of his weapons legally, law enforcement officials said. In the four months before the shootings, he also bought 3,000 rounds of handgun ammunition, 3,000 rounds for a semiautomatic rifle and 350 shells for a 12-guage shotgun, all over the Internet. No need for background checks or any questions. I mean, doesn’t everyone want a bunch of 100 round drum magazines? Aren’t they necessary for just anyone to own? The arsenal of weapons carried by the shooter were legally obtained. Guns are easy to obtain in America. There are really no words for the grief and suffering caused by the deaths of 12 people and injuring of 70. There never are. No words for burying your child who shouldn’t have gone before you. No words for the loss of a loved one forever taken in a violent and sudden barrage of bullets. No words. No words for the families re-living the experience at the trial of the shooter. No words for the lawsuit that found the ammunition company not responsible for selling those drum magazines to a mad man. No words for the family left to pay the company that made the bullets that killed their daughter. No words for the law that Congress passed to allow immunity from these kinds of lawsuits called the Protection of Lawful Commerce in Arms (aka- the gun industry Immunity law). No words for the idea that one industry should be immune from lawsuits like no other industry has. This is America. This is the American gun culture. This is what we have, brought to us by the lapdog politicians who are afraid to speak out against the corporate gun lobby. This is what happens when the gun lobby gets a bill passed to allow immunity from lawsuits against a specific industry- the gun industry. This is what happens when one powerful lobby and industry gets its’ way with power and lots of money. There is no common sense in any of this. We remember those who were injured and living with the physical and emotional scars left behind. We remember the families and friends who will never be the same again. We remember that a mad man was allowed to purchase a gun and ammunition and take the lives of innocent Americans and we did nothing about it after it happened. We remember that we have done nothing after any of our nation’s mass shootings to prevent the next one. We remember that our politicians are spineless in the face of pressure from the NRA and corporate gun lobby. We also need to remember that healing takes a very long time and many suffer from PTSD and other mental and physical injuries in the aftermath of shootings like this. All over America, families and friends ( the survivors) have to cope with the aftermath of mass shootings. This article about how Aurora has handled the aftermath mentions the mental health services still available in their community. The scars are visible and invisible but they are there- all over America, and today in particular, in Aurora, Colorado. Let’s also remember that the majority of us want to do something about mass and “everyday” shootings that take the lives of 90 Americans a day. And when we all stand up together with loud voices and demand that something happen, something may change. When we elect politicians who put the rights of Americans to be safe from senseless gun violence before gun rights, we may succeed. How many more will it take? The last few days have been difficult and heart-breaking to say the least. In my home state of Minnesota of course, a black man was shot to death by a police officer after being stopped for allegedly having a broken tail light. Really? So much to say here that I can hardly say it all. The victim had a legal permit to carry a gun around. He announced that he had that permit. Why? He didn’t have to according to Minnesota law. But he was a black man with a gun. Perhaps he was afraid that if he was found with a gun on his person, things would get hairy for him. He was right. Would he have been alive had he not had that permit to carry and announced that he did to the officer? We don’t know. I’m just thinking out loud. Philando Castile was his name. He was a beloved cafeteria worker in a St. Paul Montessori School. A role model to children. So many unanswered questions. We don’t know why he kept saying that he had this permit to carry, or so his girlfriend said he was saying. The gun lobby has been working hard to arm every American just in case….. Castile must have thought his gun and his legal permit would protect him from harm. It didn’t. Where is the gun lobby’s outrage over these shootings? Are they standing with the Black Lives Matters protest in St. Paul because a man with a legal permit to carry was shot to death by an officer? Nope. We don’t know why the officer fired his gun when Philando allegedly moved his hand towards his pocket for his ID. We just don’t know everything. People react to situations in many different ways. We do know that when a gun is present, things often go wrong. We do also know that more guns are not making us safer. We understand that there is racism abounding in our American communities fomented by fear and paranoia of “others”. We do know that the gun lobby is making it worse. We do know that one Presidential candidate in the name of Mr. Donald Trump has said that the Orlando tragic shooting could have been lessened or averted if only someone had been armed. And then came Dallas last night. Armed officers were gunned down by a couple of citizens ( or that is what we know so far) who seemed to have been upset by the peaceful Black Lives Matters protest over the Minnesota and Louisiana shootings of black men. Four guys with assault style weapons and high capacity magazines were like snipers gunning down officers on purpose- armed officers. We know that it is easy to get assault rifles and high capacity magazines in America- far too easy. We have made it easy. We allowed the Assault Weapons Ban to expire. What has happened since? Numerous shootings of innocent school children, movie goers, military members, officers, LGBTQ citizens, and others. That’s what our lack of common sense has done. And, as a reminder to my readers, most of these guns were legally obtained by otherwise “law abiding” gun owners. Good guys with guns are as bad as bad guys with guns. The least we can do is to keep guns away from the “bad guys”. But what do we do about the good guys? We are in the deep end, my fellow Americans, drowning in anger and frustration, guns and violence. I don’t know about you, but when I woke up this morning and read the news from Dallas, I felt like the country had tipped toward anarchy. The U.S. is an exceptional country, all right. Exceptional for its political, social and racial polarization. Exceptional in its acceptance of gun ownership. You can feel despondent. You can feel hopeless. I am despondent but not feeling hopeless. As someone who has lost a sister in a domestic shooting, I have been re-traumatized by these latest shootings. I watched the now viral video taken by the girlfriend of Philando Castile. I watched the blood ooze from his shirt. I heard his dying moans and breaths. What if there was a video of my sister’s last moans and breaths? What if? What if this was your loved one as President Obama said in a speech given last night before the Dallas shooting. What if? What if our elected leaders were made to watch videos and see photos of the victims’ last dying breaths? What if this was one of theirs? And who will protect the children as I asked in my last post? There was a 4 year old girl in the back seat of Philando Castile’s car who saw him shot and watched him die. How can we forget the children who witness such awful murder in their young lives? No rush. Every day 90 Americans die from gunshot injuries. No rush. 5 officers were just gunned down in Dallas. No rush. 49 LGBTQ Americans were just gunned down at a nightclub in Orlando. “Another terrible tragedy occurred last night, this time in our own backyard, when Philando Castile was shot dead by a police officer in Falcon Heights. Philando was a much loved 32-year-old cafeteria supervisor at a St. Paul Montessori school who was black. According to police reports, he was pulled over for a tail light violation and a handgun was “recovered at the scene.” According to his girlfriend, the officer shot Philando as he reached for his identification as per the officer’s request. Philando was armed, but had clearly announced that he had a permit to carry a handgun. His girlfriend, sitting next to him in the car with her young child in the backseat, streamed a video of Philando as he slumped over, bleeding, having been shot four times point blank. The video allows us to hear the officer yell at her and then handcuff and detain her, while she narrates, weeps and prays that Philando will survive. It is difficult to watch. Because this awful incident involved gun violence, Protect Minnesota is expected to make a definitive statement and “take sides” on the issue. At this time, with so much still unknown, I am not prepared to do either. But I do have some thoughts to share. What follows isn’t short and pithy–I’m a pastor after all!– but I hope you’ll find it helpful. This was the second questionable shooting of a black man by police in the U.S. in as many days. According to the Washington Post, there have been 509 police killings in America so far this year, with African Americans being killed at a rate 2-1/2 times greater than whites. President Obama today said that African Americans are 30% more likely than whites to be pulled over and three times more likely to be searched by the police. Whatever other particulars arise, racism cannot be discounted as a key element of this tragedy. Often-hidden but always present, racism is like a strand of barbed wire woven into the fabric of our society. Its barbs catch, tear and hold back every institution, organization and individual as we strive to move forward towards justice. Since it would be naive to think that law enforcement does not reflect the racist attitudes that permeate our culture, this incident cries out for a full investigation by the Department of Justice. But nothing is black and white: according to Philando’s girlfriend in the video, the officer was Asian American. It’s safe to assume that he also experiences racial discrimination on a regular basis. At this time we cannot know how that factors into the equation. So even as we demand justice for the killing of Philando Castile, we can have compassion for the frightened officer who shot him. 3. On the NRA and the gun lobby. In its continuing efforts to arm America in order to generate more profits for the gun industry, the gun lobby has done much to perpetuate two distructive myths that I believe may have played a role in Philando Castile’s tragic death. Myth number 1: Gun violence is really just a “black on black” violence problem. The NRA loves to quote statistics about how many black people kill other black people. Why? Because it feeds the fear that blacks are dangerous so we must carry guns to protect ourselves against them. In reality, according to FBI’s most recent statistics, 84% of white murder victims are killed by white people, compared to 90% of black murder victims who are killed by black people. Whites are six times more likely to be murdered by another white person as by a black person. And here’s the kicker: 82% of gun deaths in Minnesota are suicides, an overwhelmingly white phenomenon. Unfortunately, we never hear about the epidemic of “white on white” gun violence, but the “black on black” myth has been swallowed whole by the media. The image of the scary black man with a gun has become a psychological meme in white America–and the gun lobby seems to be fine with that. How do I know? Listen to their deafening silence in response to Philando’s shooting. A permit-holding, law abiding American who was exercising his 2nd Amendment right was shot point blank by a police officer for no other reason than stating that he had a permit to carry. Where is the NRA’s outrage? Have they joined the Black Lives Matter protesters outside the Governor’s mansion? We hear the NRA trumpet that after every terrible shooting. Well, this time it was a “good guy” with a gun who did the terrible shooting. If a licensed police officer who has completed many hours of firearms training and testing on justified and unjustified shootings could over-react to such deadly effect, how can we expect untrained “amateurs” to respond with measured self-control when faced with a real or imagined threat? This is the aspect of Philando Castile’s death that falls within the missional scope of Protect Minnesota. Our task is to counter the myth that more guns equal more safety. They don’t. More guns equal more gun tragedies. More gun crimes. More mass shootings. More domestic gun murders. More black on black gun violence. More white on white gun violence. More gun suicides. More unintentional gun deaths of children. And yes, more police shootings. The common denominator is the gun. We at Protect Minnesota join President Obama, Governor Dayton and the larger gun violence prevention community in expressing our deepest condolences to the family of Philando Castile. We grieve at the senseless loss of a good man who was loved by the children at the school where he worked. We weep at the thought of the trauma that his girlfriend and her young child have experienced and will relive every time the video is played. Our prayers are with all people of color in our community who have been wounded by yet another apparently unjustified shooting of a black man by law enforcement. Our hearts are open as well for the dedicated and honorable police officers throughout our state and nation who will now face greater suspicion and increased risks. The false claims of the gun lobby have us in this position. How do officers deal with armed citizens? Often they are outgunned by people on the streets. How do communities deal with more heavily armed young men in their communities? How do the young men in affected communities get their guns so easily and why do they feel like they need them? Why are officers so quick to stop people of color for minor traffic violations? Why are officers more afraid of black people with guns than white people with guns? Realities. More guns are NOT making us safer. The gun lobby is dead wrong. This is about racism. This is about intolerance. This is about fear. And this is, at the least, about guns. Micah Xavier Johnson didn’t have a criminal record and apparently acted alone in the carefully planned ambush during a march downtown, a law enforcement official, who was not authorized to comment publicly, told USA TODAY earlier Friday. Seven other officers and two civilians were also wounded. Johnson’s Facebook account included the names Fahed Hassen and Richard GRIFFIN or Professor Griff, the Dallas Police Department said in the statement. GRIFFIN, who embraces a “radical form of Afrocentrism,” police said, also authored a book titled A Warrior’s Tapestry. Extremism of any kind and guns and ammunition are a lethal mix. We have proof of that over and over again. But we are still waiting to act. July 4, 2016- Who will protect the children? On this Independence Day, I will again remind my readers that what goes up must come down. My friend Joe Jaskolka knows this all too well. His story is told here by my friend who writes the New Trajectory blog. Joe survived the bullet that lodged in his brain that New Years’ Eve of 1999 when he was just 11 years old. Someone celebrating their second amendment rights changed Joe’s life forever. I have met Joe and his father. I know how his life is now. Who protected him that night from someone with a gun? No one could have predicted this. But if the odds of being hit by celebratory gunfire are indeed low, so too are the odds of ever being caught for engaging in it in the U.S. Cases where authorities can precisely pinpoint the location of the gun — let alone identify the shooter — are incredibly rare. The legal consequences for those who do get caught are mixed, with charges ranging from the misdemeanor to felony level and fines ranging widely. And why do people do this in the first place? On one level, the answer is the obvious one: It’s recklessness, frequently abetted by drunkenness. People may actually not realize that the bullets they launch into the air will inevitably land somewhere, with potentially disastrous results. But on another level, there are basic economics at work. Many municipalities ban outright the sale of another New Year’s staple: fireworks. That means residents have to be able to afford to travel outside city limits or even cross state lines in order to buy them. Meanwhile, ammunition can be plentiful, already at hand, and, in many cases, simply cheaper. But when guns, celebration and possibly alcohol are mixed together with people whose rights don’t come with responsibilities, these kinds of shootings happen often enough that we should be very concerned that your child or grandchild could be affected next. Anyone with common sense should understand that bullets shot into the air do come down somewhere. What are they thinking? Not much apparently. Those guns bought for self protection more often than not end up harming or killing some other innocent American citizen. So my purpose in writing about this is that, before I met Joe Jaskolka, I never thought about the possibility that someone would be injured or killed by celebratory gunfire. I want others to know that this is possible and to make sure there are not armed people nearby celebrating on our national holidays by shooting bullets into the air. As states have relaxed laws related to fireworks sales over the past decade, emergency doctors saw an increase in both the number and severity of fireworks-related injuries among young people, the data show. They determined that the number of patients under age 21 treated and released by emergency departments between 2006 and 2012 rose modestly: from 4.28 per 100,000 people in 2006 to 5.12 in 2012. Significantly larger increases were seen in injuries requiring inpatient hospital admission, which skyrocketed (if you’ll pardon the pun) from 29% of cases in 2006 to 50% in 2012. Laws matter as it turns out and are there for good reason- to protect children from avoidable injuries and death. Rights come with responsibilities. On this day when we celebrate freedom, independence and love of country, we should take our responsibilities very seriously. A few days ago, a story circulated about a 3 year old Kansas child who was visiting a home in Tennessee with his parents. Unfortunately and tragically for all concerned, the boy found a loaded gun in the home, not stored away from small hands, and he shot himself in the face. What caught my attention on the news story video was the sign in front of the house that promoted the owner’s second amendment rights with the saying: “protected by the second amendment”. Who was there to protect that child from the owner’s second amendment rights? The second amendment does not, according to the gun lobby, guarantee the right of the rest of us to be safe from those who promote it with no restrictions, regulations or moderation. This is not acceptable and should not be accepted as fact. Who will protect our children from those who are not practicing their second amendment rights responsibly? Most gun owners are safe and responsible. But many of them refuse to participate in efforts to make sure all are responsible. Pass safe storage laws so guns must be stored safely or there will be a penalty. Pass Child Access Prevention Laws and enforce them to make adults responsible for leaving loaded guns within easy reach of children. Make sure all gun sales come with a Brady background check. Pass laws to make sure domestic abusers don’t have guns. Children ( and women) are often shot during domestic shootings. ASK if there are unsecured, loaded guns in the homes where your children play. Require everyone who buys a gun to have training with a firearm before walking out of the gun store or gun show with said gun. Restrict the number of rounds allowed to be used with firearms. Restrict the features that can be added to assault type rifles to turn them into weapons of mass destruction. Charge gun owners whose guns are used by children to kill themselves or others. Contact your elected leaders and demand that they act to save the children. Join an organization working to prevent gun violence. It’s about prevention. Understand that any restrictions on firearms does not lead to confiscation of guns or taking away second amendment rights. Remember that these are myths promoted by the corporate gun lobby. Report anyone using a gun irresponsibly at a celebratory community or family event. Don’t assume anything. Take irresponsible gun use seriously. With rights come responsibilities. Change the conversation about the role of guns and gun violence in America. On this day of national celebration, please remember that we are better than this and must act to keep our children safe from devastating gun violence. A new NRA website called sharethesafety.org is promoting the purchase of guns for others who can’t “afford” them. This is the exact opposite of everything we know about gun safety. A brazen attempt to arm people in neighborhoods where supposedly people can’t afford guns is a ludicrous and dangerous promotion of gun sales to make a profit off of death and injury. We already know that our young people of color in these kinds of neighborhoods are already quite heavily armed and causing death and mayhem every day in inner city urban neighborhoods. Minneapolis has seen an increase in shootings in affected neighborhoods this year. Recently a beloved woman, Birdell Beeks, was shot by a stray bullet in her neighborhood. All we need are more guns legally or illegally owned killing innocent people. Please read the Violence Policy Center’s “Blood Money” if you don’t believe me. It’s not sharing the safety. It’s sharing the death. This is the American we have. Is this the America we deserve to have or want? I think not. Remember that more people have died from gunshot injuries in American than all Americans who have died in wars. Is this patriotic and love of country? Children and innocent Americans should not be collateral damage. If we take this seriously like we do death by any other cause, we will do something about it. If we love our country and are patriotic, we will do whatever it takes to save our children from a country dripping in guns and bleeding from gun deaths and injuries like no other country not at war. Be safe out there today and Happy Fourth of July. Disclaimer- It turns out that the website, sharethesafety.com is a hoax and a parody about the NRA. Sometimes parodies reflect the truth and in this case, we can all believe that the NRA would promote the buying of guns for people who can’t afford them because they often use that myth as a way to complain about gun restrictions. What I also find interesting is that low-income Americans can barely afford clothing, food and the necessities of life. It’s likely they won’t need a gun to live their daily lives. The other point is that there are young people who don’t have a lot of money to afford guns but can easily get them on the streets cheaply. Easy access to guns for those who shouldn’t be able to get them is a serious public health and safety problem in our country. Guns are weapons designed to kill other people. They should be expensive and more difficult to access. According to the above article, the NRA has filed an official complaint about the men who launched this hoax website. It hit too close to home apparently. Americans love their guns. They love them too much if we are to believe the statistics about the daily carnage in our country. And yes, let it be said that most Americans who own guns for hunting or casual use are careful and legal with their guns. That said, let’s also say that the fact that too many of those otherwise “responsible” and “law abiding” gun owners are not. The difference between being irresponsible with your hammer or not careful with your knife and not being responsible or careful with your gun could be a lost life. Why? Because hammers and knives, when used for their stated purpose, can cause some bodily injuries or maybe even get used in homicides or to harm others but the infrequency of that compared to gun deaths and injuries is a fact. And guns inherent and obvious use is to kill a person or an animal. Americans love their guns to death. Most gun deaths are suicide in our country. And then there are those pesky “accidental” discharges killing our children and toddlers once a week or so. Ater Thursday’s mass shooting at Umpqua Community College claimed ten lives in Roseburg, Oregon, officials revealed that Christopher Harper Mercer, the gunman behind the attack, had owned a stockpile of 14 firearms. The number elicited shock from the gunman’s father live on CNN: “How was he able to compile that kind of arsenal?” Ian Mercer asked. But as it turns out, owning ten or more firearms isn’t all that uncommon: According to a forthcoming study of gun ownership conducted by Harvard researchers, more than six million Americans already do. In other words, there are more people in America who own ten or more guns than there are residents of Denmark. Take a look at this video clip of a Bill Maher show about how we love our guns and love to openly carry them for effect ( or at least how the minority of us love their guns). Twenty-year-old Adam Lanza reportedly used a Bushmaster .223 rifle, a type of AR-15 semiautomatic rifle, to gun down 20 children in their first-grade classrooms on Friday. AR-15s were one of 18 semiautomatic weapons banned under a 1994 law that expired in 2004 despite broad public support and a drop in gun fatalities, USA Today reported at the time. Since then, killers have used semiautomatics to target victims en masse at Virginia Tech; theFort Hood military base; anAurora, Colo. movie theater; aSikh temple in Wisconsin; and now an elementary school in Newtown, Conn..
Let’s see. Are we safer from mass shootings now that that has happened? What kind of weapons are often used? Right. AR-15s or AK-47s. High capacity magazines designed to attach to assault weapons are easy to buy in our country. Perhaps we need to restrict the amount of ammunition one can buy at once and require background checks for ammunition as well. Remember the Colorado movie theater shooter’s on-line purchases of thousands of rounds of ammunition? The victims’ families do. It’s kind of hard to argue that it’s OK for someone to be able to buy this much ammunition with no background check or even with a background check for that matter. We are not talking your average deer or pheasant hunter here. We don’t know yet how the San Bernardino shooters obtained the 2 assault rifles used in the shooting but all guns start out as legal purchases so presumably they can be traced to their original owner. But it’s easy enough to buy as many guns as one wants or needs for some kind of attack right here at home- terror attack, domestic shooting, school shooting, or whatever. Go online, and it is not hard to find semiautomatic AR-15-style rifles offered for sale as “California compliant.” This is despite a series of laws dating to 1989 that banned a number of specific brands, as well as certain generic features. Also, Californians can still legally possess assault rifles that they owned before the prohibitions went into effect as long as they have registered them with the state. More than 100,000 such weapons are registered. The ban on high-capacity magazines, as well as the requirement that a magazine be affixed to the gun, was meant to prevent firing dozens of rounds from a single magazine and then quickly reloading, as has happened in many mass shooting cases. The development of the bullet button took advantage of a provision in California law allowing the sale of a gun with a magazine that could be removed with a “tool,” rather than simply by pressing a release-catch with a finger. You can see how gun lobby amendments or loopholes get added to otherwise strong gun bills so they get their way anyway. And worse than that, it’s easy for those who are prohibited from buying guns legally from also getting them legally because we haven’t made it illegal. You know what I mean- buying guns from private sellers at a gun show, on-line a flea market or maybe from a relative or friend who doesn’t know that you are a domestic abuser. We know that many of the everyday gun deaths are preventable. The research, helpfully aggregated by the Harvard School of Public Health’s Injury Control Research Center, shows that after controlling for variables such as socioeconomic factors and other crime, places with more guns have more gun deaths. The research is actually a bit weaker for mass shootings — in large part because such tragedies are, thankfully, somewhat rare, so they’re difficult to study. But the basic point is that we know restricting access to guns — and, better yet, confiscating guns — could help prevent thousands of gun deaths. We don’t make sure that people like the shooter of the Planned Parenthood clinic in Colorado Springs have their guns taken from them because they could be a danger to themselves or others. So we let them keep their guns because…. rights. And now, of course, 3 innocent Americans just lost their right to life, liberty and the pursuit of happiness. Often love affairs end in separation or divorce. It seems like the time is here to divorce the corporate gun lobby from the elected leaders who have been frightened into doing their bidding- sort of like the power and control an abusive partner has on their spouse or partner. Yesterday the Senate was forced to take a vote on background checks and the terror gap loophole in our gun laws that allows known terrorists on the no fly list to purchase guns anyway legally. The Senate, while debating repealing Obama Care once again and taking away the rights of women to legal health care options, in it’s pandering to the gun extremists, voted to allow extremists, terrorists, domestic abusers, felons and others to be able to buy guns legally. The Brady Campaign sent a letter to Congress just hours before the shooting in San Bernardino warning Congress of the dangers to Americans if we don’t close the terror gap and require Brady background checks on all gun sales. You can’t make this stuff up. In the face of 2 horrendous mass shootings, home grown terror or otherwise, our Senators failed us. Here is the list. You can thank those who had the common sense to understand that keeping our country safe from domestic abusers with guns who target a clinic that provides services to women they are trying to deny, should be a priority. And you can ask what the others were thinking when they voted to allow terrorists to get guns legally and to allow just anyone to purchase a gun with no background check. It’s time to divorce the pandering, fear, paranoia and money interests from our own supposedly deliberative body of law makers who should vote their consciences rather than their fear of being re-elected. Do we have a democracy any more? Those who voted no on these life saving measures will be held accountable. The American public is in no mood to just accept this any longer. They just may divorce some of their leaders and vote for those who are willing to stand up for the victims and survivors and understand that more guns have not made us safer. Indeed, the opposite is what is happening every day. 89 American families a day are mourning their loss of a family member to gunshot injuries. This is the definition of insanity. We are better than this. It’s past time to demand common sense action. Go ahead and pray for the families if you think that will help. And think about them every day. As long as it isn’t your loss, it’s easy to divorce yourself from the carnage. But when suddenly it’s your loss, it’s a different story to tell. Schools, shopping malls, Planned Parenthood clinics, hospitals ( a Denver hospital was held hostage by a gunman yesterday), colleges, gatherings of public employees in a public building, and any other place where shooters choose their targets should be free from gun violence. And no, you gun rights extremists, guns carried by law abiding gun carriers just don’t make a difference in shootings like this. That nonsensical argument needs to be put to rest once and for all. When the shooting began at the Planned Parenthood clinic, a gun permit holder wanted to get involved. He was told to get away. How would law enforcement know if he was the shooter in question or just a guy with a gun trying to take matters into his own hands. And the love affair also extends to carrying guns around in nearly all public places, sometimes openly carried, by a bunch of folks who are flaunting their gun rights just because they can. There are plenty of people who shouldn’t be carrying guns but do so anyway because of flaws in our laws. Check out this article in the Star Tribune by someone who admits that he has enough prior mental difficulties due to depression and PTSD that he is a person who really should not be allowed to carry a gun. But he got his Minnesota permit anyway. But debating the supremacy of public policy vs. my civil rights is of little use for the moment, because for the next five years I can walk into any federal firearms licensee storefront in Minnesota and walk out with a semiautomatic pistol, high-capacity magazines and all of the ammunition I can afford. How many permit holders are there like me in Minnesota? That’s impossible to tell. The Centers for Disease Control and Prevention reports that each year 6.7 percent of U.S. adults 18 or older experience a major depressive disorder. And nearly two-thirds “do not actively seek nor receive proper treatment,” according to the Depression and Bipolar Support Alliance. Doing the math, Minnesota can expect that thousands of the more than 200,000 citizens with permits to purchase — as many as 8,900 — will experience a major depressive disorder this year. Like me, they’re not appearing on the sheriff’s radar. Unlike me, they don’t receive treatment. So we have more than a serious problem. It is really an emergency. But our legislators and Congress members put their heads firmly in the sand and hope it will go away. What they are really hoping is that they don’t have to deal with gun issues. Why? Because in their heart of hearts most of them actually are on the side of reasonable gun laws just like me. But they are afraid to say so because the gun extremists, a mere minority of Americana and even of law abiding gun owners, might go after them. So what? 92% of Americans and even gun owners and NRA members want their leaders to do the right thing. One has to ask then, who are our leaders truly representing? Not me. Not you. Not the way too many victims and survivors. Not gun owners. We need the question answered. Yes, of course. Senator Ted Cruz flaunting gun rights while the families of the latest victims have not yet buried their loved ones. I would say shame on him but he won’t listen because his mission is all about getting elected no matter what and pandering to God and gun rights extremists. Just when you thought things couldn’t be more ridiculous, I ask you to take a long look at the family of Nevada Assemblywoman Michelle Fiore packing heat for their Christmas card photo. Nothing says merry and happy and joy like a 5 year old holding a Walther P22. She loves her guns and her right to look totally out of touch with America and likely many of her constituents. May she have a safe new year though with kids bearing arms, that is iffy. The 17th of May (Syttende Mai) is Norway’s Constitution Day, a wonderful spring holiday celebrated with red, white and blue ribbons and flags, national costumes and big smiles as Norwegians everywhere mark the historic signing of their Constitution (Grunnloven) in 1814. That year marked the beginning of Norway’s gaining her independence from Sweden, fully realized in 1905. The 17th of May evolved over the years in Norway as a day for people to rally for political change or to stand unified during the German occupation (1940-45), when open celebration of the holiday was strictly forbidden. Today, thousands march in children’s and people’s parades all over the country and wherever Norwegians are found–expressing their cultural pride, joy in springtime and honoring those citizens who created Norway’s constitutional government, founding her independence. The Syttende Mai parades are not military but of Norway’s citizens, marching to the bright music of community and school bands. Decorations of leafy birch branches–in celebration of winter’s end–and Norway’s flag of red, white and blue make for a festive atmosphere. Both my husband and I are of Norwegian ancestry. My maternal grandfather emigrated from Norway. My husband’s maternal grandparents, along with several of his aunts and uncles, also emigrated to Minnesota from Norway. We have visited with and stayed with relatives from both of our families on a trip to Norway many years ago. We happened to be in Oslo for the May 17th celebration. It was a great experience to be there for the festivities and see the national costumes and even get a glimpse of the King and Queen waving to the crowds from the palace balcony. The 2011 Norway attacks were two sequential lone wolf terrorist attacks against the government, the civilian population, and a Workers’ Youth League (AUF)-run summer camp in the Oslo region on 22 July 2011, claiming a total of 77 lives. The first was a car bomb explosion in Oslo within Regjeringskvartalet, the executive government quarter of Norway, at 15:25:22 (CEST). The bomb was made from a mixture of fertiliser and fuel oil and placed in the back of a car. The car was placed in front of the office block housing the office of Prime MinisterJens Stoltenberg and other government buildings. The explosion killed eight people and injured at least 209 people, twelve of them seriously. The second attack occurred less than two hours later at a summer camp on the island of Utøya in Tyrifjorden, Buskerud. The camp was organized by the AUF, the youth division of the ruling Norwegian Labour Party (AP). A gunman dressed in a homemade police uniform and showing false identification gained access to the island and subsequently opened fire at the participants, killing 69 of them, and injuring at least 110 people, 55 of them seriously; the 69th victim died in a hospital two days after the massacre. Among the dead were personal friends of Prime Minister Jens Stoltenberg and the stepbrother of Norway’s crown princess Mette-Marit. It was the deadliest attack in Norway since World War II, and a survey found that one in four Norwegians knew “someone affected by the attacks”. The European Union, NATO and several countries around the world expressed their support for Norway and condemned the attacks. On 13 August 2012, Norway’s prime minister received the Gjørv Report which concluded that Norway’s police could have prevented the bombing of central Oslo and caught the gunman faster at Utøya, and that more security and emergency measures to prevent further attacks and “mitigate adverse effects” should have been implemented on 22 July. My city had a beautiful memorial service for the victims of that awful incident. I attended the service and was touched by the outpouring from local folks of Norwegian ancestry and many who just came to express their concerns and sympathies. Breivik had several fake police badges printed to wear with a police uniform, which he had acquired illegally on the Internet, and which he later wore during the attack. Contrary to his expectations, he was unable to get any firearms in the Czech Republic, commenting that it was the “first major setback in [his] operation”. In the end, he concluded that Prague was “far from an ideal city to buy guns”, nothing like “what the BBC reported”, and that he had felt “safer in Prague than in Oslo”. You may remember that I wrote about the gun laws in several countries on a recent river boat cruise of the Danube. The Czech Republic was one of them, along with Germany, Slovakia, Austria and Hungary. Brevik was mistaken. Though the Czech Republic’s gun laws are somewhat looser than other European countries, they are stricter than he was led to believe and he was very wrong about Prague in particular. The only danger we faced there was from the crowded streets and making sure our personal belongings were safe from pick pockets. Originally, Breivik intended to try to obtain weapons in Germany or Serbia if his mission in Prague failed. The Czech disappointment led him to procure his weapons through legal channels. He decided to obtain a semi-automatic rifle and a Glock pistol legally in Norway, noting that he had a “clean criminal record, hunting license, and two guns (a Benelli Nova12 gaugepump-action shotgun and a .308bolt-action rifle) already for seven years”, and that obtaining the guns legally should therefore not be a problem. Upon returning to Norway, Breivik obtained a legal permit for a .223-caliberRuger Mini-14 semi-automatic carbine, ostensibly for the purpose of hunting deer. He bought it in late 2010 for €1,400 ($2000). He wanted to purchase a 7.62x39mmRuger Mini-30 semi-automatic carbine, but did however for unknown reasons buy the Mini-14. Getting a permit for the pistol proved more difficult, as he had to demonstrate regular attendance at a sport shooting club. He also bought ten 30-round magazines for the rifle from a United States supplier, and six magazines for the pistol (including four 30-round magazines) in Norway. From November 2010 to January 2011 he went through 15 training sessions at the Oslo Pistol Club, and by mid-January his application to purchase a Glockpistol was approved. Anders Behring Breivik wrote in a 1,500-page manifesto that he bought 10 30-round ammunition clips for his .223 caliber rifle from an unnamed small U.S. supplier, which then in turn acquired the clips from other suppliers. Norway forbids the sale of clips for hunting rifles that hold more than three bullets, according to Norwegian newspaper Aftenposten. Breivik wrote in his manifesto that while he could have purchased the high-capacity magazines in Sweden, they would have been significantly more expensive than ordering them from a U.S. supplier. He wrote that he spent $550 for the 10 clips. He also described legally buying four 30-round clips for a Glock handgun in Norway. Not surprising. Everyone knows that it’s easy to obtain guns and ammunition in the U.S. So here is another look at the gun laws in Norway. Norway ranks 44th in the world for the number of civilian owned firearms. The rate of gun homicides in 2012 was .10 per 100,000, far lower than that of our own country. The rate of gun suicides in Norway was 1.63 per 100,000, higher than gun homicides as it is in almost all democratized, developed countries. In Norway, as in most other countries, licensing and registration of firearms and owners is required and carrying guns in public is prohibited. There is, as I have written many times before, an unmistakable link between strong gun laws and low gun civilian deaths and injuries. This is a case for our advocating for stronger gun laws in our own country. Norwegians and most other countries are using common sense when it comes to protecting their children and communities from devastating gun violence. Occasionally a mass shooting occurs in one of these countries even with stronger gun laws. In some countries, a change to stronger gun laws has occurred after high profile mass shootings. The shootings in Dunblane, Scotland and Port Arthur, Australia are two examples. In the wake of the 1987 Hungerford massacre, in which one lone gunman killed 16 people, Britain introduced new legislation — the Firearms (Amendment) Act 1988 — making registration mandatory for owning shotguns and banning semi-automatic and pump-action weapons. Within a year and a half of the Dunblane massacre, UK lawmakers had passed a ban on the private ownership of all handguns in mainland Britain, giving the country some of the toughest anti-gun legislation in the world. After both shootings there were firearm amnesties across the UK, resulting in the surrender of thousands of firearms and rounds of ammunition. Britain has never had a “gun culture” like that of the United States, but there were about 200,000 legally-registered handguns in Britain before the ban, most owned by sports shooters. All small-bore pistols, including the .22 caliber, were included in the ban, along with rifles used by target shooters. Penalties for anyone found in possession of illegal firearms range from heavy fines to prison terms of up to 10 years. A conservative politician took the lead.Australia’s conservative Prime Minister John Howard spearheaded a push by Australian states and territories to severely restrict gun ownership that year, in what came to be known as the National Firearms Agreement. Again, this was the kind of common sense not seen in America. And the result? Gun suicides declined. “In the 18 years (1979–96) [before the law], there were 8850 firearm suicides (annual average 491.7). In the 7 years for which reliable data are available after the announcement of the new gun laws, there were 1726 firearm suicides, an annual average of 246.6. Let’s get this straight. America loses over 30,000 of its’ citizens to firearms injuries every year. The majority of these are suicides followed by homicides and then accidental gun deaths. This is the American tragedy and we can’t let it continue. Anyone who says that gun laws don’t matter is deceiving you. The American corporate gun lobby has managed this deception for many years now with little scrutiny from the media and too many of our politicians. There is proof that stronger gun laws lead to fewer gun deaths. So what we need in our own country is a common set of facts that are known and believed by our elected leaders and the general public. For this is how change can happen. This is how we can make sure that our nation’s public health and safety epidemic of gun violence can be addressed in a reasonable way. And by reasonable I mean that we need to make sure that all guns are kept from some people who shouldn’t have them. It’s pretty simple. Those who shouldn’t have them are children, suicidal teens and adults, domestic abusers, felons, those with adjudicated and severe mental illness, terrorists, gang members, and others on the prohibited purchasers list now who can get guns anyway without background checks and through straw purchasing, stolen guns and unsecured guns in homes. We can save lives if we put our minds to it, deal with the issue from a fact based perspective, have a change in our conversation about the role of guns and gun violence in our communities and put our heads together to protect our children so they can grow into adults who contribute to their society and reach their human potential. Too many lives are cut short before that happens. 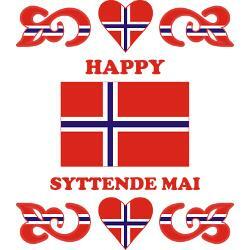 So back to Norway and Sytennde Mai– I hope all of my Norwegian relatives had a wonderful celebration. And I hope they will all be safe from harm. I do know that they are much less likely to be harmed by firearms than their cousins in America. It doesn’t have to be this way. Let’s get to work to change laws, hearts and minds.